The team at Red Dog Resort & Spa is dedicated to delivering excellence for all of our pet guests each and every day. 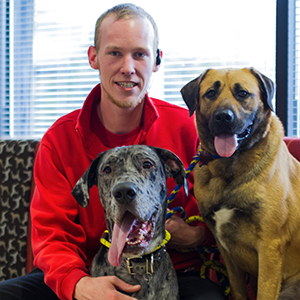 Our leadership team has extensive experience working with animals and hold multiple certifications in pet care. We get to know our clients and are proud to provide them with peace-of-mind that their pets receive the very best care when they are at Red Dog! 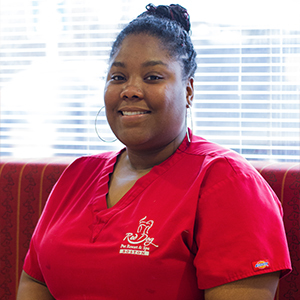 Leigha joined the Red Dog Team as a Pet Care Specialist in 2012 and has since been promoted to Supervisor, Red Dog’s Assistant Manager and is now Red Dog Boston’s Resort Manager. 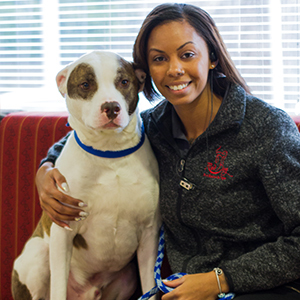 Leigha truly has a passion for animals and is always willing to learn more about animal behavior and care. When Leigha is not at Red Dog, she loves to bake and to travel whenever she has the chance. At home Leigha has two wonderful companions, Reese, a 7 year old orange tabby cat, and Titan, a 4 year old pit/husky mix. Charles started as a supervisor at Red Dog Northshore in 2017 before being promoted to Resort Operations Assistant Manager here in Boston. 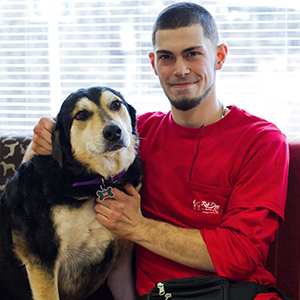 He has worked caring for and assisting training dogs for over two years. Before joining Red Dog, Charles spent nearly 10 years raising and training exotic animals in zoos in a management role. Charles gained an extensive knowledge of canine behavior living alongside wolves. He lives at home with his Great Dane Apollo as well as his current foster dog through Last Hope K9 Rescue.